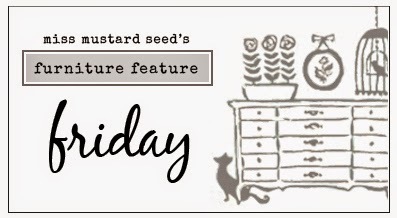 I was excited about the theme for this month because it went right along with my plans for the desk. 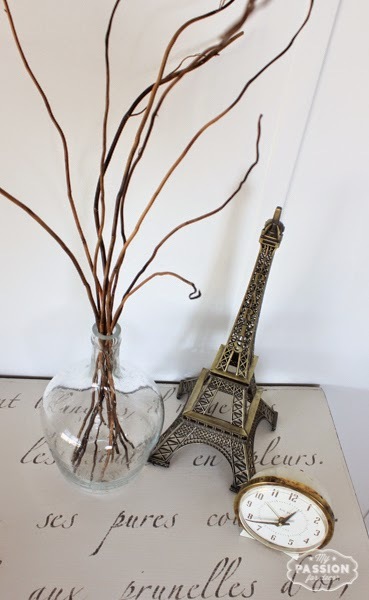 I had a stencil from Royal Design Studio, Springtime in Paris Letter Stencil, that I'd originally bought for a wall in my master bedroom. 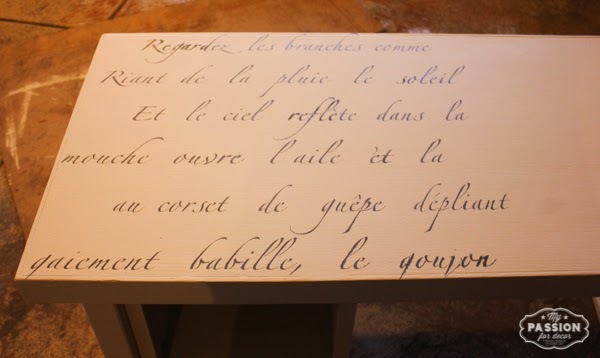 It's a stencil of a beautiful French poem about spring. Since I hadn't used it in my bedroom, I thought why not try it on the desk? 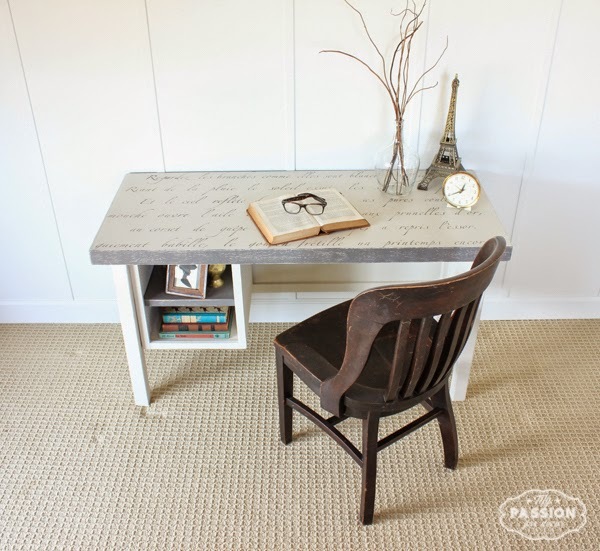 One other reason I was looking forward to this project was the new paint I bought from my friend Jill of Weathered Pieces. 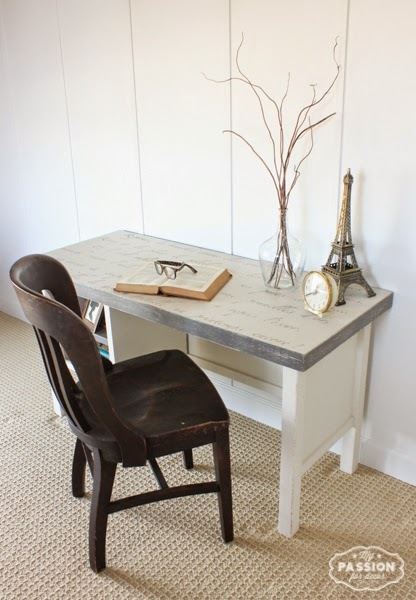 The paint is called Faux Mineral Paint and I'll be using and writing more about the paint in the future...I love it!! 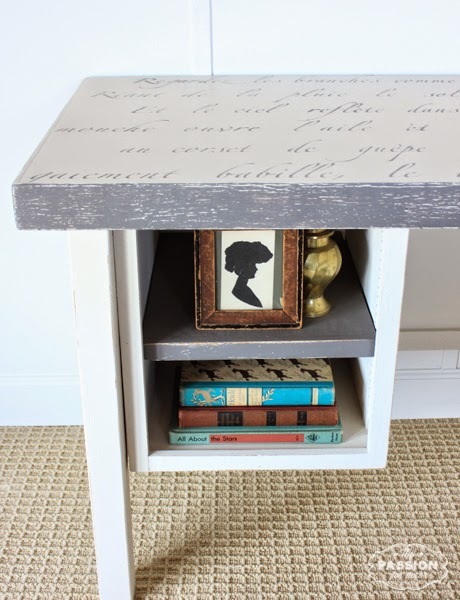 For this piece I used Faux Real Mineral Paint in Bella and Carbone. Bella is a light off white and Carbone is a dark grey. The desk is deceiving and looks smaller than it really is. 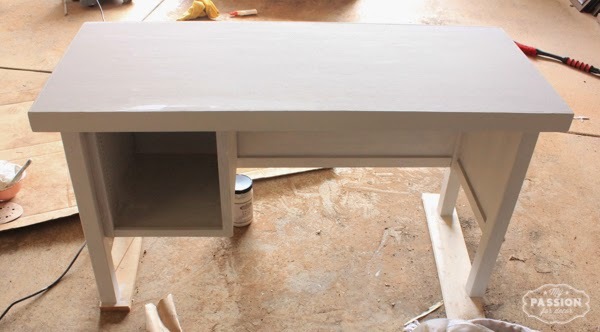 Once I painted two coats on the entire piece inside and out I had used about 3/4 of my paint. It's a lot of square footage! 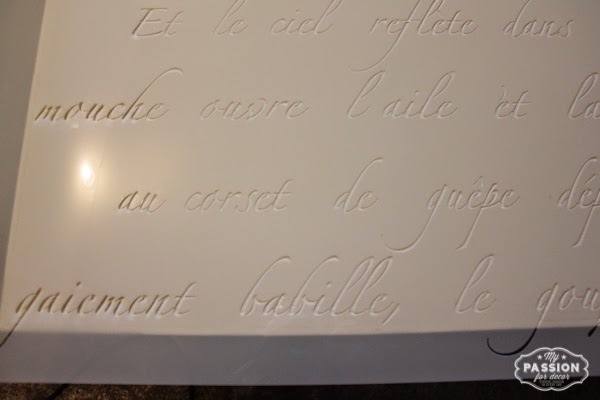 After I gave the desk two coats of Bella, it was time for the stencil. 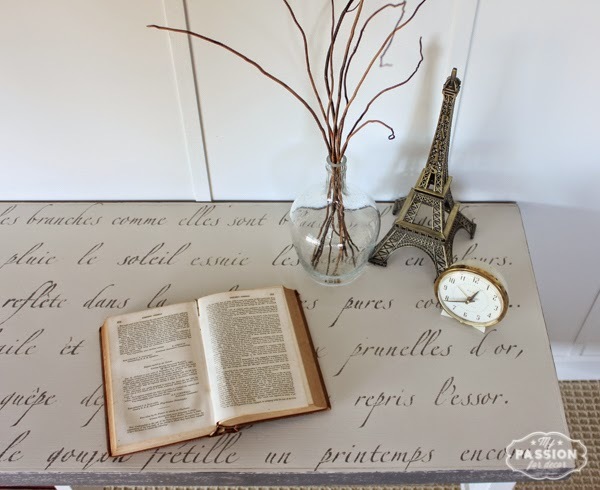 The stencil was a bit bigger than the desk, so I had to play with the placement a bit. The stencil comes in two pieces as well, which meant I needed to work in sections. I lined it all up and then taped it into place with painters tape. For the stencil I was using Carbone as a nice contrast to the off white Bella. 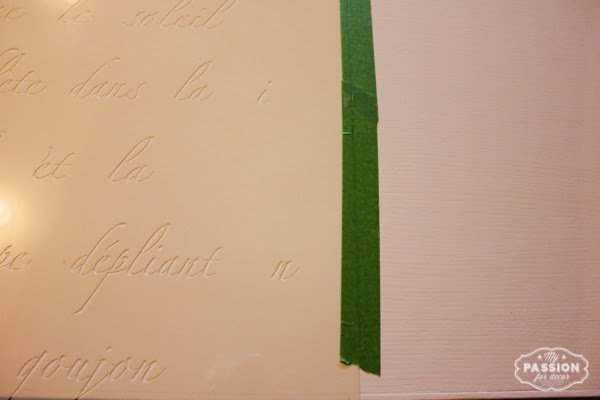 The only way stenciling works for me is to apply two thin coats. 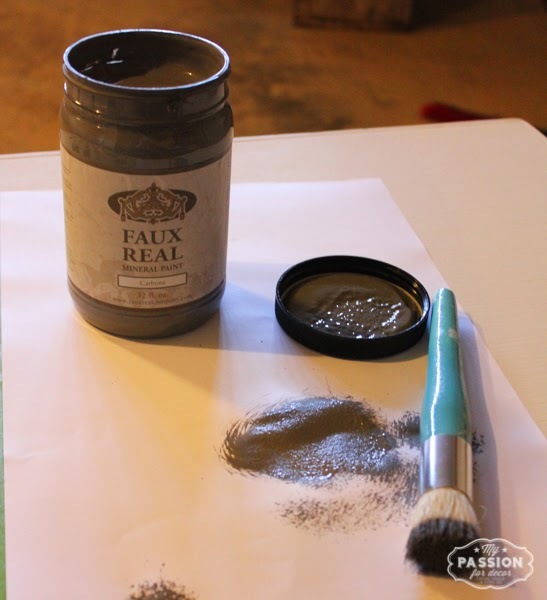 I use a large stencil brush and pounce the paint on, once I've dabbed off the excess on a paper towel. This is how it looked after my first coat. And after two coats on the first section. 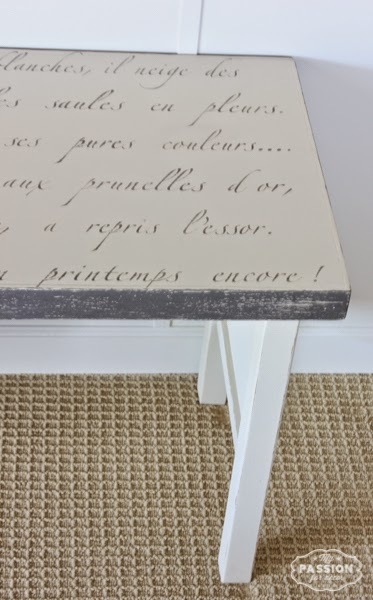 Once the the stencil was complete, I painted the edges and shelf Carbone. 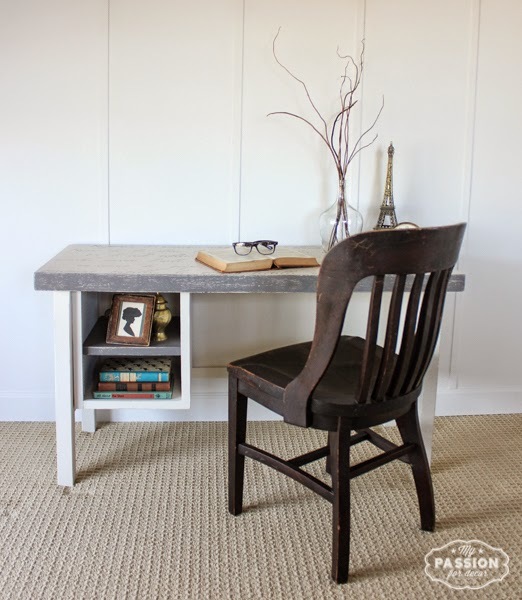 After the finishing touches on the paint, I lightly distressed the top and edges of the desk with 220 grit sandpaper. 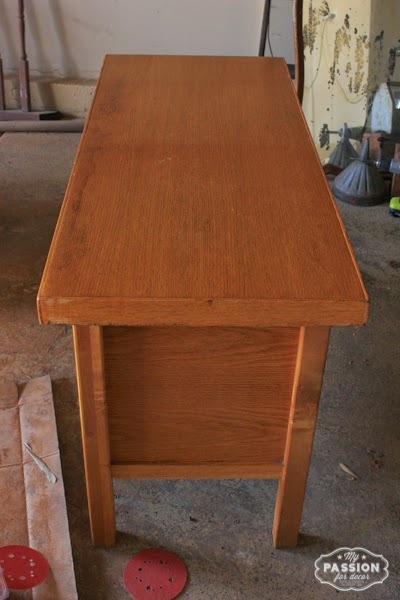 Finally, I sealed the top with a coat of clear wax and I was done. 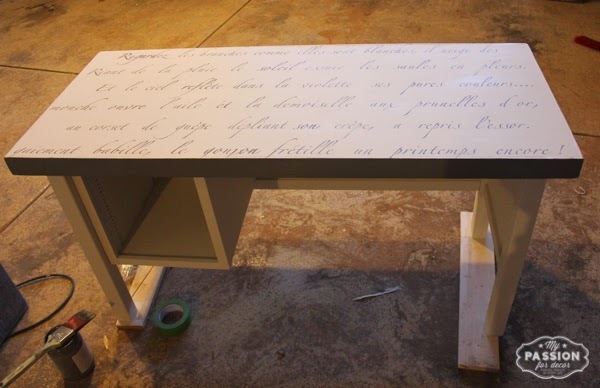 Here's the finished Distressed French Poem Desk! 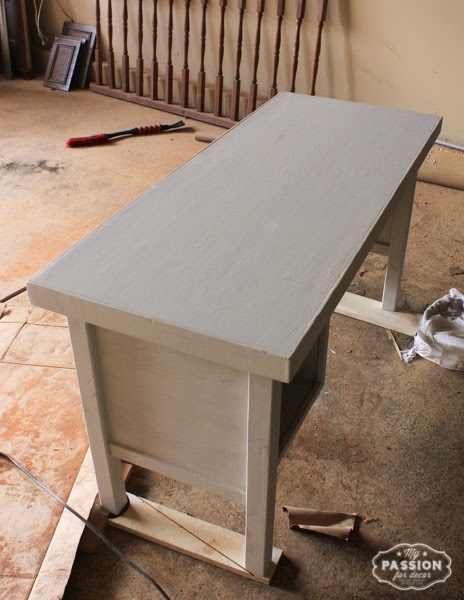 I'm happy with how the desk turned out and I can't wait to use this brand of paint again. 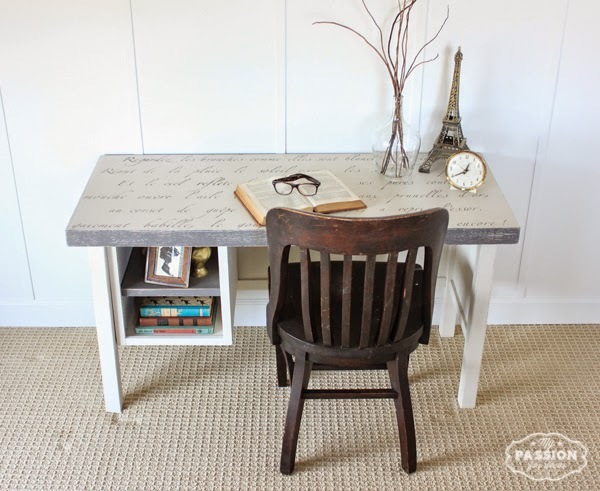 The stencil was just right for the desk and the words are perfect for this time of year as well. 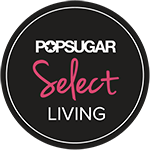 I hope you'll stop by and visit all the different blogger's sites so you can see their beautiful makeovers. 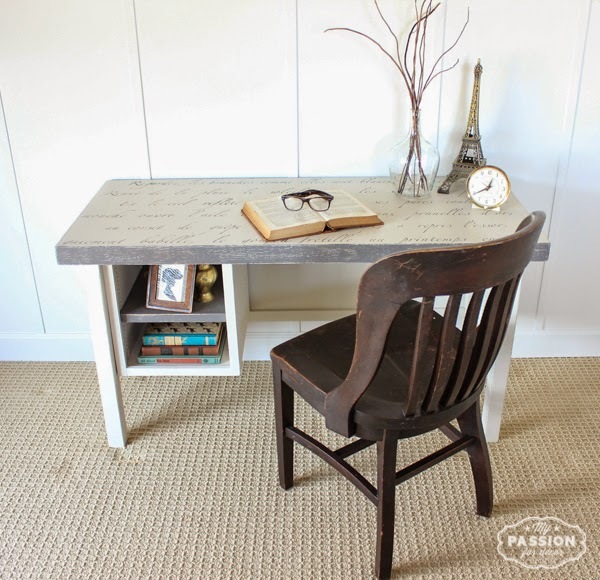 Your desk turned out stunning and the stencil is the perfect touch. 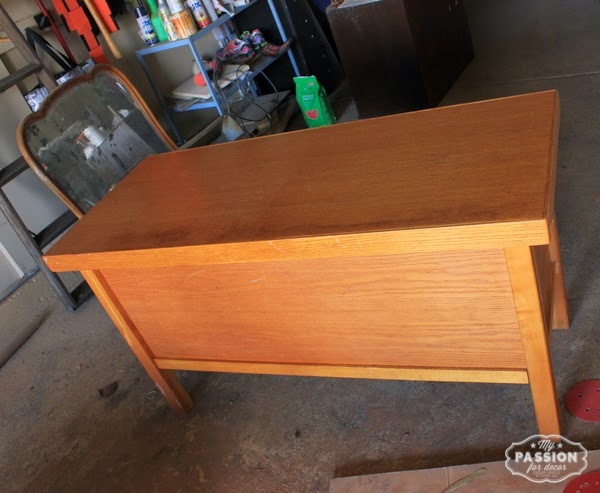 You would have never known it's previous life was a miter saw table! Great job! Looks awesome and adorable, that poem is perfect! Wonderful makeover, Melody! 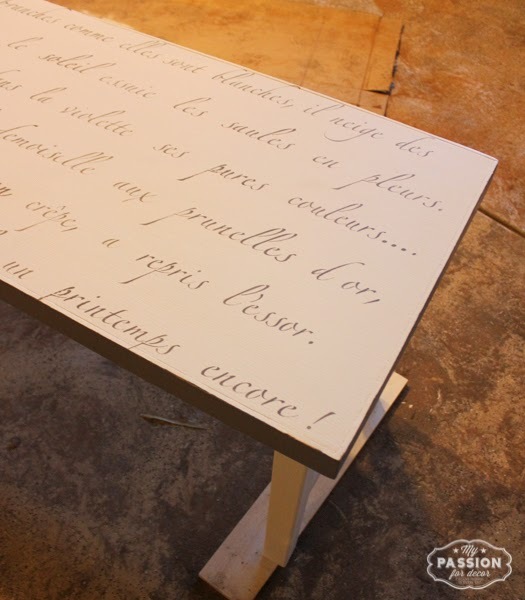 I love the idea of using a french poem on a desk. We were in Chicago last weekend and I was amazed at the selection of great furniture at low prices at Goodwill. We visited at least six stores and I was so sad that I couldn't take a single piece home with me! This is beautiful Melody!! 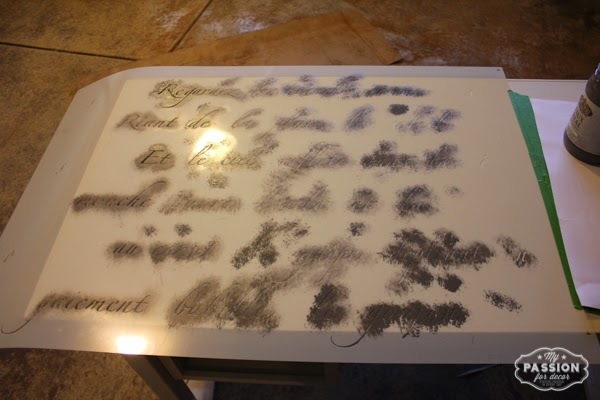 I love the script on the top :) It doesn't look like the same desk at all! Oh my goodness! It's beautiful Melody! And I love the way you paired it with that chair and have it styled! Very very nice. 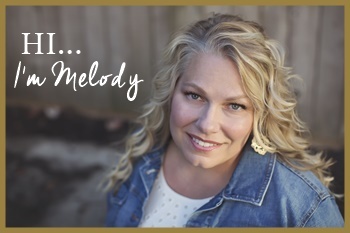 Very pretty Melody! 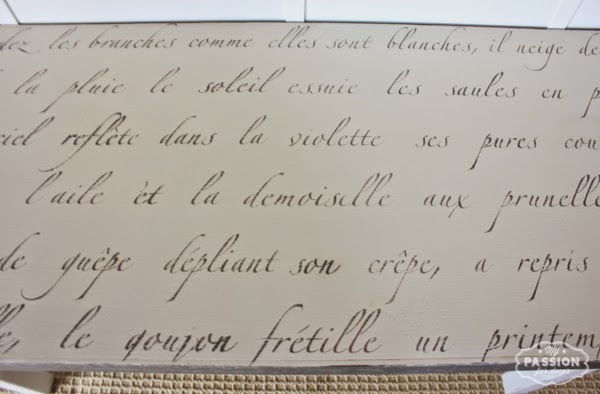 Love the french script on top! 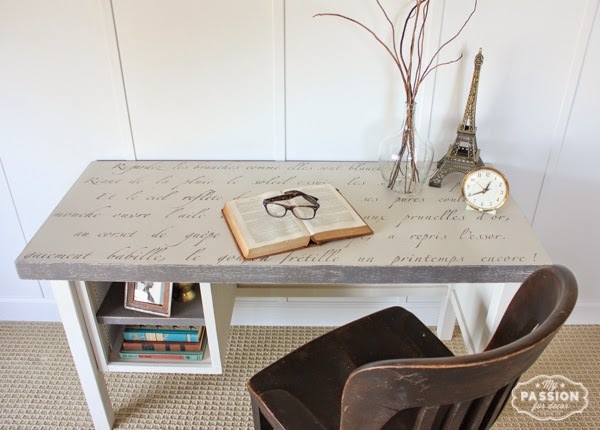 I love this desk. 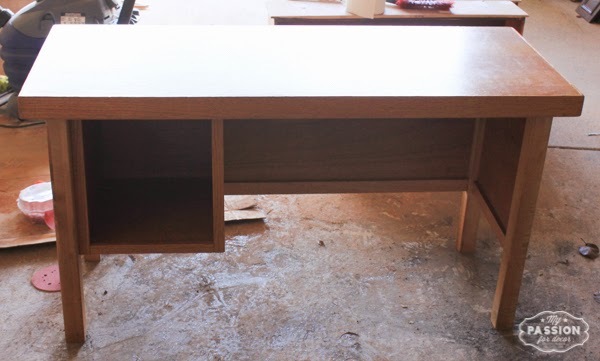 Wow, I can't even believe it is the same desk after as it was before. The Script is so lovely. Great work. I love this. 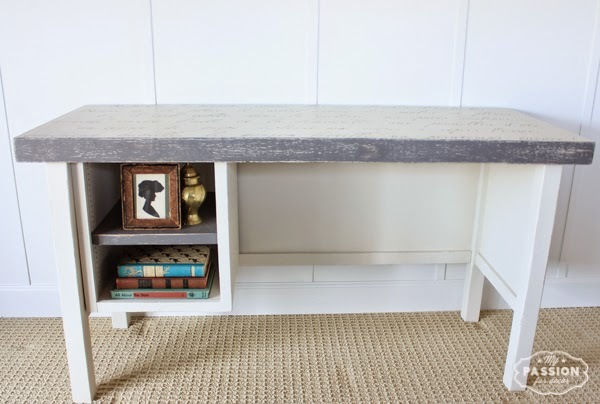 Talk about a gorgeous redo!